I purchased one of these at a boy scout summer camp. I purchased one of these at a boy scout summer camp. It's ok but a little small for me (I am 6'1"). The net hangs on my head and face. Without the net (flipped over) it's fine but I would not want to camp in a buggy area without the net. Price is right on at $40. Not long enough for me at 6'1"
Setup is straightforward and easy. Use your own straps or purchase the ropes for this and it is really easy to hang. It does not come with a rainfly or tarp so you will need to purchase one of these. 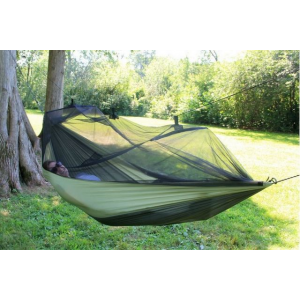 It is nice in that you can use the netting or flip the hammock over and use it net-less. Comfort is good without the net, but if you are big and try to use the net it is difficult to fit in it. I am 6'1" and my head is so close to the end that the netting hangs onto my face and head. I find this good for lounging but not for overnight camping. And you still have to buy a rainfly to keep the rain off you. If you are shorter and want something really small and compact this may be for you. If you want something larger and more set up for camping you should look elsewhere. very light, weighs a pound. around $50. all you need is less than 5 minutes to hang up. all you need is a few feet of strong rope, about $5 at lowes. comfortable all you need is a small tarp to stay dry on rainy nights. i have used mine for the last 2 years for long mountain hikes and short camping trips too. 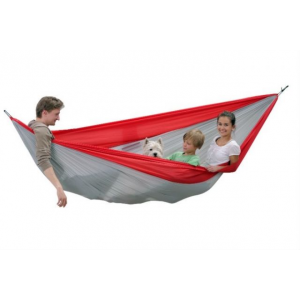 for a similar hammok it would cost at least $150. I picked up this hammock after a peer decided to go full-time hammock camping. It's a good little hammock, but you have to tell yourself "I only paid 40 bucks" a couple of times. I don't think it would survive multiple years of abuse, and you have to be careful getting in and out at first, but nonetheless, I like this little bugger. I first used it peak bagging in Maine in the summer, so the bugs were out in force. A few minor details about setting up and getting comfortable the first time I used this little guy, but approaching thunderstorms, lightning, darkness, and intoxicants may have played a role. 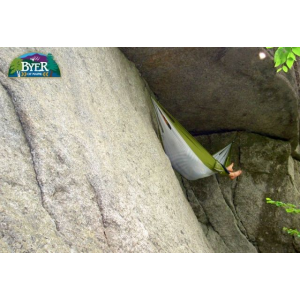 One more thing... Get a tarp in addition to this hammock before you go out on the trail. Design: 3 season could be 4 seasons with a quilt. Weight: Under a pound, the weight of a can of soda. 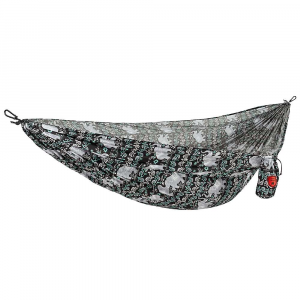 This is a very comfortable hammock that is extremely lightweight, and packs to a small 7"L x 7"W x 3.5"H. This hammock gets mixed reviews but as a avid hiker it performs very well. I live in Florida so this is a plus for bug protection. Very easy to hang, very easy to get in and out of. You can add a sleeping pad inside if you must. I weigh about 160 lbs and it supports me with no problem. I know guys at 250 lbs using this with no problem but maybe a little stretch as all nylon hammock do. I would recommend this hammock as a starter hammock, or to an avid hammock camper. It comes nestled in its own pouch attached to the hammock. You can store a bottle of water and some gear in this pouch. It also has two other pouches stitched inside the hammock on the mesh for other gear. It comes with a suspension rope/guy line for the netting. There is no hanging kit for the hammock itself but that is no a big deal. Go to a hardware store, or order a slap strap, micro rope hanging kit, etc. I use a tarp over this as my tent. Also waterproof the hammock with Sno Seal Silicone Water-Guard or other brands. Now you have a factory silicone nylon protected hammock and tarp. This is one of the best camping hammocks available for the price. 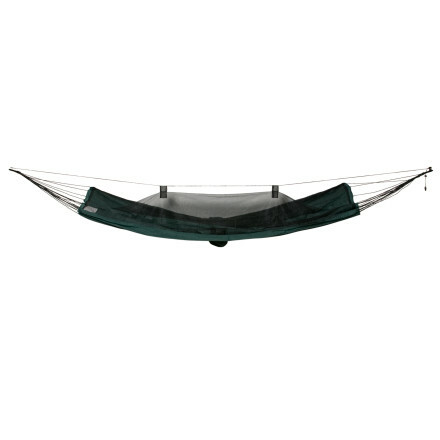 I purchased my hammock from REI. My husband cannot sleep on the ground because of back problems. This was the perfect answer! The hammock comes with a stuff sack and is VERY lightweight. I enjoyed napping in the hammock during the day while my husband was fishing for dinner. If you have never used a Brazilian hammock... Do not lie end to end in this hammock. Lying end to end will cause you to be squashed in the middle of the hammock with your partner. 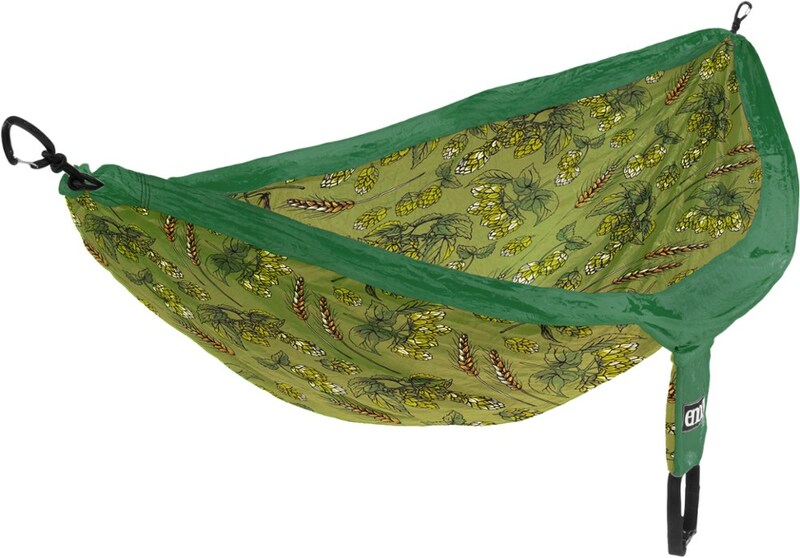 It is nearly impossible to lie diagonally in a Brazilian hammock. The most comfortable way to lie in the hammock is from side to side (with the hanging clips to your right and left). A 3 is a well deserved rating. It stands halfway between perfect and, well, crap. As does the Moskito. Every measure has been taken to cut weight - this thing is incredibly light, I will not lie. However, the construction does suffer. The 10 or 12 ropes "securing" the hammock to whatever is used to suspend it (hooks, tree straps, etc.) are reminiscent of shoelaces. One does not feel secure laying down. Furthermore, every measure is taken to encourage you to lie diagonally because the hammock is constructed "the Brazilian way", i.e. the "shoelaces" on each side of the hammock are of an uneven cut, forming a triangle with one leg longer than the other. The result: unless one is able to find "the spot", so to speak, he/she will always slide toward the right side of the hammock, (and sometimes off as happened to my less than fortunate hiking partner). Unless you've had experience with Brazillian hammocks before, skip this one (I know that it looks great on the pic., and that it has the MOST FUNCTIONAL net settup in the current hammock market). However, if you're in for a challenge, buy it and train yourself - a few times I was able to find "the spot" and sleep happy/bugfree for hours. The Byer Moskito Traveller is not available from the stores we monitor. It was last seen March 14, 2015	at REI.